The Prince-President became ‘Emperor of the French’ under the name Napoleon III. In 1853, he commissioned the specialist in religious painting, Hippolyte Flandrin, a pupil of Ingres’s, to paint his portrait. Flandrin’s painting is psychologically very acute and, despite its official character, it skilfully reveals Louis-Napoléon’s complex personality. The artist even managed to catch the emperor’s ‘distant and inscrutable’ look. «This is without doubt the first ‘true’ portrait we have of H.M.» declared Théophile Gautier. This ‘truth’ however did not please Napoleon III; indeed so much so that the commission was cancelled. The emperor preferred the standing portrait by Winterhalter, now destroyed, with its more distinguished nobility and flattering idealisation. 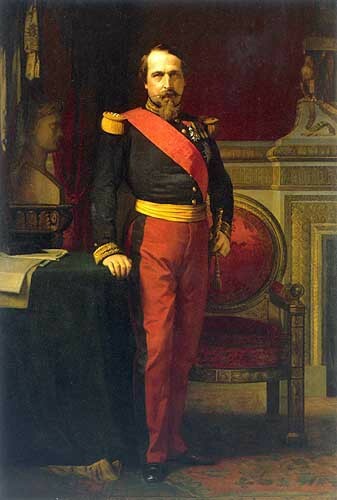 Napoleon III ended up however accepting Flandrin’s painting. First presented at the London Universal Exhibition in 1862 and then later at the Salon of 1863, this portrait met with great public success.